The great British sculptor never let ego get in the way of his work, and was inventive to the end. 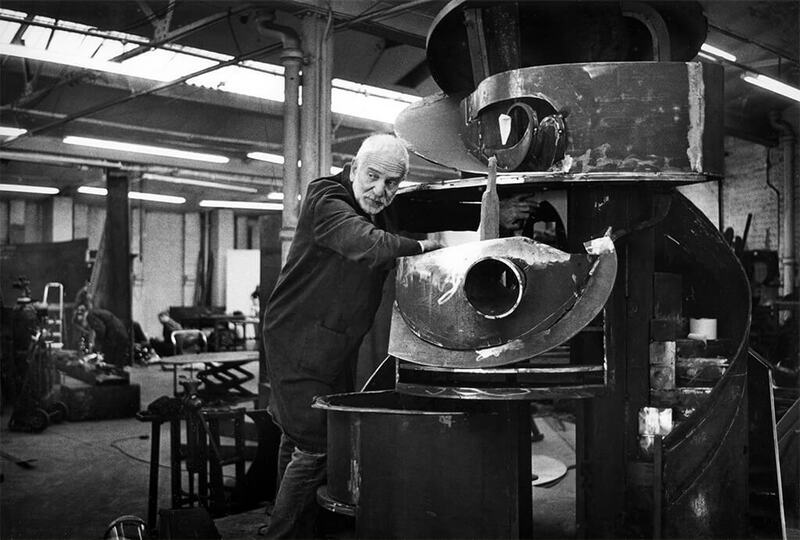 Sir Anthony Caro, who died on Wednesday of a heart attack aged 89, was an artist who remained not only active but inventive to the last. In the past year alone he had three major exhibitions: a distilled retrospective at the Museo Correr in Venice (until 27 October), an exhilarating outdoor exhibition of mega-scale sculptures spanning four decades at Chatsworth House, Derbyshire, as well as recent work at the Gagosian gallery in London, the last a series of huge working models planned for an even bigger public art project that would have proceeded down New York’s Park Avenue. Unfortunately, through lack of funds, that project never came to fruition, but he seemed happy to cut his losses and concentrate on developing new projects, saying that he could see himself working into his 100th year. In life, Caro cut a cheery, avuncular figure, and there was never any sense that the great esteem in which he was held as Britain’s greatest living sculptor after the death of Henry Moore, had led to an overweening ego. 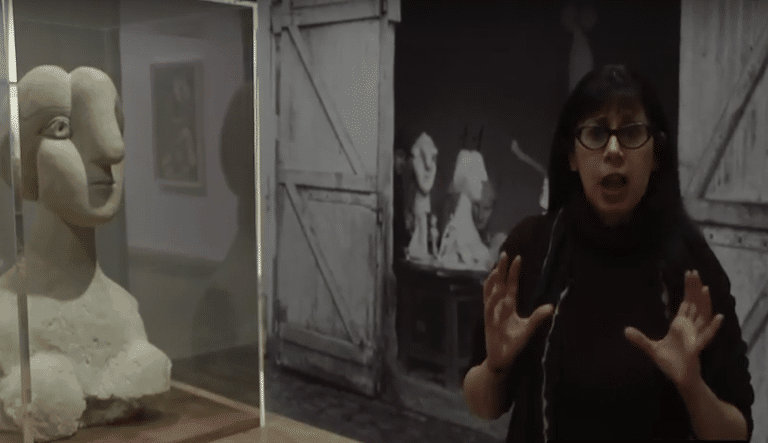 He must have been sensitive to that danger, since, as Moore’s assistant in the 1950s, he had seen it happen at close hand to his mentor: as Moore’s fame increased, and as the size of his sculpture followed suit, so, it appeared to Caro, did Moore’s ego. Moore could never understand Caro’s radical departure from the figure. After visiting Caro’s solo exhibition at Whitechapel Gallery in 1963, he called the younger sculptor’s welded steel constructions “window dressing”. It was a cruel dismissal that Caro only learnt about decades later, after Moore had passed away. Caro’s interest was in the Cubism of intersecting planes, and his greatest influence from the late Fifties on was the work of David Smith, the great American sculptor associated with the Abstract Expressionists. It was Smith’s welded geometric forms in light-reflecting brushed steel that utterly seduced Caro on his first trip to the States. Caro is often cited as the first sculptor to do away with the plinth, but Smith had already gone in that direction with some of his Cubi, as had Brancusi before him. Caro’s great innovations were the completely open form of his work, the fact that it lay low and horizontal, at a level with the viewer, the fact that there was no frontal view (you could come at the work from any angle) and that it was painted, often in very bright colours. 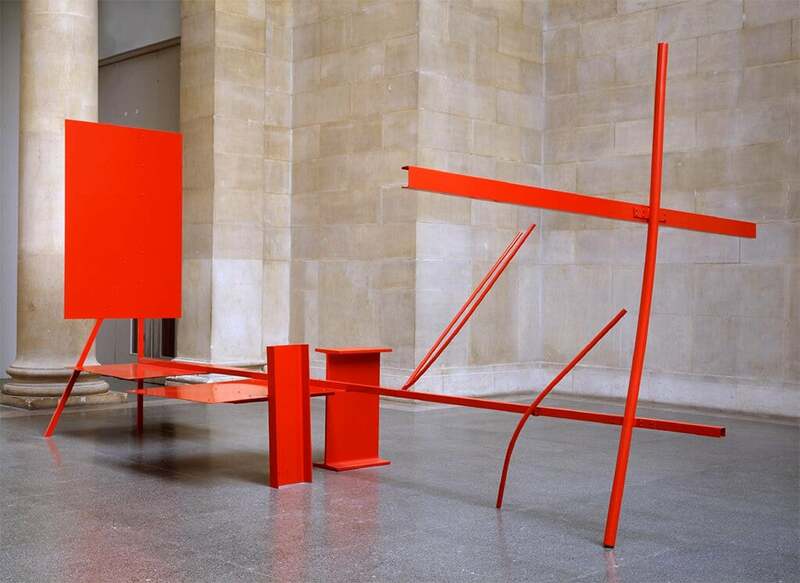 Early One Morning, 1962 (pictured), is the seminal sculpture of the Sixties, and consists of a series of carefully balancing planes and lines in siren-red. Sculpture had never before appeared so light and airy, and with so much surrounding space. In the Eighties, Caro surprised once again by returning to the figure, or at least introducing allusive and playfully figurative elements into his work. He borrowed heavily from art history and classical mythology, sometimes overtly. The Barbarians, 2000-2002, featured a group of six wild horsemen brandishing spears, bows and whips and accompanying a lonely figure on a chariot pulled by an ox; and one of his last great projects, and certainly among his most complex, was The Chapel of Light, 2008, at Saint-Jean Baptiste church in Bourbourg, Northern France. A permanent architectural installation in the restored Gothic choir, which had been severely damaged during a bombing raid in the Second World War, The Chapel of Light consists of a rich variety of forms, from the severely geometric to those, rounded and voluptuous, alluding to the human figure. Here industrial steel, concrete, wood and stoneware are seamlessly combined in a rich palette of textures and natural colours. Even at its apparently most solemn and most monumental, playfulness and humour are to be found everywhere in the work. Such mercurial qualities that the work possesses must surely have been part of the very fabric of Caro’s being. This article first appeared in The Arts Desk on 24 October, 2013.